The Mesa Creek trail is located in the Curecanti National Recreation Area near Cimarron, Colorado. The trail follows a short section of the Gunnison River near the outlet of the Morrow Point Dam past the mouths of the Cimarron River and Mesa Creek. 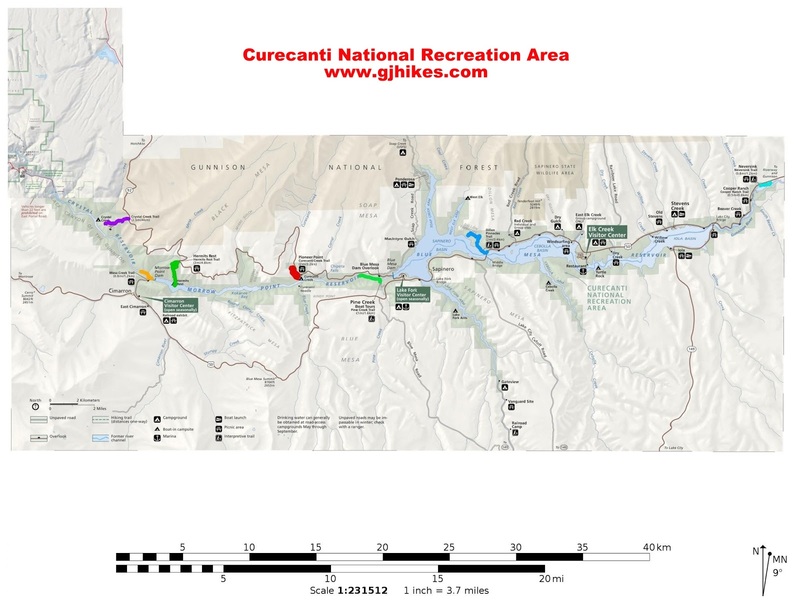 The Gold Medal fishing waters of the Gunnison River are accessible from the trail. Near the turnoff from Highway 50 at Cimarron there is a Visitor Center with a railroad display and a campground that can accommodate both tents and trailers. To get to the trailhead turn off of Highway 50 near Cimarron and follow the paved Morrow Point Dam Road for almost 1 mile through the rugged Cimarron Canyon. Cimarron is a little less than 20 miles from Montrose, Colorado. The trail starts out making a gradual descent down the hill from the parking area to near the level of the Gunnison River. The Cimarron River comes cascading down the canyon beside you to its confluence with the Gunnison River. Before continuing on the trail you can stroll over and get a closer look at the Morrow Point Dam. The Morrow Point Dam, constructed in 1968, was the first thin-arch, double curvature dam built in the United States. It stands at 468 feet tall from the streambed. Getting back on the right path the trail crosses a bridge to the other side of the river. The sign warns visitors that the water level may vary suddenly with increased releases from the dam. After crossing the bridge the trail continues for a short distance as a well constructed path where efforts were made to hold back the sloughing mountain side and shore up the trail. The trail becomes more rocky and primitive as you continue. The Gold Medal waters of the Gunnison River attract enough fishermen that they keep a well worn path that is easy to follow. The bridge over Mesa Creek comes up within a half mile from the trailhead. From here you can walk upstream a short distance but the main trail continues along the river. There is one table along the trail where you can enjoy a picnic in the peaceful surroundings of the canyon. There are probably plenty of other places where you can find a good rock in just the right place and do the same. Isn't that sweet. That little rock is holding up that bigger rock that is holding up that huge boulder while we walk past it. It's probably been like that for a few thousand years but I think we will move our picnic somewhere else. We seem to have run out of land so this should be the obvious place to turn around. Maybe there are times when the water is lower and you can continue around the corner. 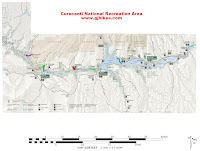 The Curecanti National Recreation Area brochure lists the Mesa Creek hike as 1.5 miles. We put in a little extra distance walking up to the dam and viewing the kiosks near the trailhead that had a lot of interesting information. The Mesa Creek trail is in one of the most beautiful settings that you will find anywhere. From the pristine waters of the Gunnison River to the rugged cliffs of the Black Canyon the Mesa Creek trail gives you an up close adventure. If you would like to see it for yourself then all you have to do is 'Take a hike'.